It all started with these. I’m not a huge fan of eggplant, and Mike’s even less so, but when I saw the big bags of tiny, shiny-skinned eggplant at the Arcadian Fields table at last Saturday’s farmers’ market, I couldn’t resist. 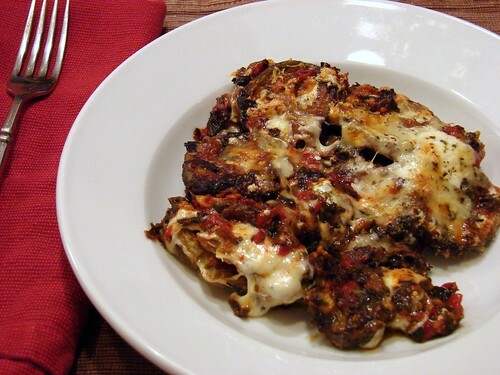 With cold, rainy weather predicted for this week, I knew I wanted to do something similar to eggplant parmesan, though I didn’t want to fry the eggplant, and I also wanted to incorporate a bit more vegetable matter into the dish. Mostly, I wanted to come up with an eggplant dish we’d really love. I ended up borrowing a technique from Nancy Jo’s winning Eggplant Parmesan recipe from food52, salting my eggplant slices, drying them, then tossing them with flour and oven-frying them on sheet pans. When my eggplant coins were crisp and browned, I layered them in a baking dish with a mixture of slow-roasted plum tomatoes, frozen chopped spinach, thawed and well-drained, and the same blend of cheeses Mike’s been playing with for his pizzas. What we ended up with was a very unpretty, but surprisingly tasty eggplant casserole, so good, in fact, that my eggplant-averse husband went back for seconds. As did I.
I’m on a mission now: Mike and I are both generally good about eating our favorite seasonal vegetables, but as we enter into the cooler months of the year, I want to work with as many of our lesser-loved vegetables as possible and try to find at least one way to cook them that leaves us wanting more. I think we’ve found our new favorite way to eat eggplant. This looks great. I am so making this. My oldest son loves eggplant parm. and he moves in Mon. I went to Food 52 and saved it. I am going to have to make part of it with soy cheese for my younger son. Thanks for bring this to my attention. That’s a really good idea. I’m not a big fan of eggplant either but I really like the sound of this dish. I’m not a big fan either but I think I might try this, my local market has some that will be a lot less rubbery than the supermarket ones. This looks like a must try. 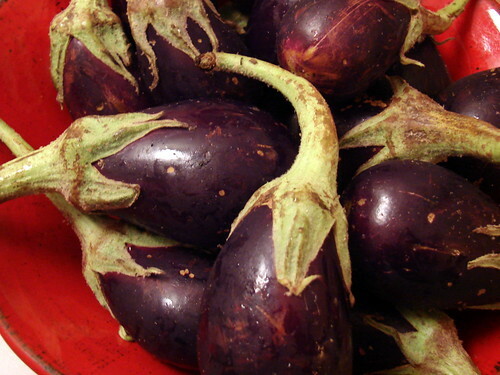 One question, since you aren’t rinsing the eggplant, how do you avoid a really salty dish? I tried salting a cucumber (for a relish) earlier this summer and ended up with really salty cucumbers after following the recipe exactly as written. 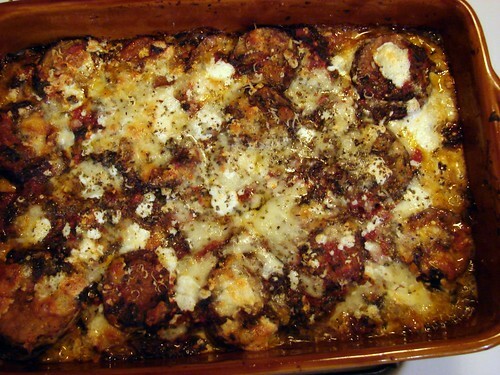 I’ve been really liking this toss-everything-together-and-bake take on eggplant parm. No salting, no frying, no separate steps. I’m not sure why I’d make it any other way again. I bought the same bag of cute eggplants last Saturday! I was planning to fry ’em up for eggplant parm sandwiches, but I think I’ll borrow your/NancyJo’s technique instead. Thanks for the inspiration! While I am a giant eggplant fan, the husband is less of one. This looks like it would be right up his alley. What’s not to like?